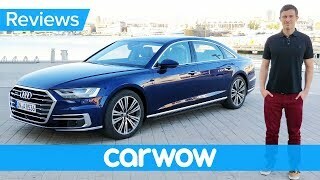 I know that when I was in the market for a car that I really wished there was a better video showing exactly how the Traffic Jam Assist\Congestion Assist on the 2017 Audi A4 with Driver Assistance Package. 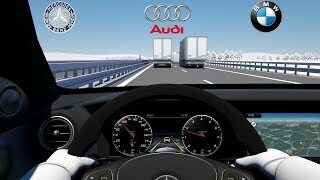 So I decided to make one so that anyone considering purchasing an Audi vehicle with the driver assistance package can see exactly how it works. You can only get the Audi A4 with Driver Assistance package on the Prestige trim of the A4 . 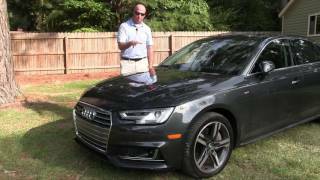 My vehicle is the 2017 Audi A4 Prestige with Driver Assistance Package, Sports Package, Ventilated & Heated Seats, and rear heated seats. The MSRP was 56K for my car with all the options included. I have to say I absolutely love the vehicle and fully recommend it to anyone considering the A4. What’s that button under the heating seat button? I’ve never seen that before. R. RiDER Air conditioning in the seats for your back. You can opt for “hot weather package,” to get that feature. Why do you have the ventilated and heated seat on at the same time? Lol the warmth can make your back a little to warm and hot, when the ventillation is on at the same time it feels amazing. Sad that audi makes it difficult to have the pack. Moving to Volvo now. Thank you for your video this is exactly what I was looking for! Thanks for showing the video. Not many professional auto review blogs cover these driver assistance package in much detail. On Audi's part though, they should be making this package available on all trims. Trying to get the Driver assistance package otherwise becomes really a ~15 to 20k option on these vehicles. Seriously - I wouldn't have gotten prestige trim if you were able to get this package on premier plus. 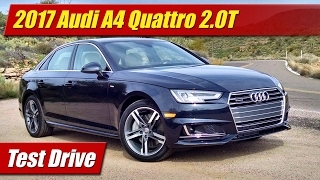 My a4 was 56500 MSRP - ridiculous. hi, does the lane keep assist work really well? specifically... 1. does it stay in the center of the lane or does it just "ping pong" or bounce between the lines of the road (even when set in "early" mode)? 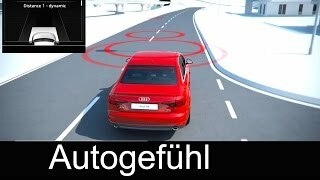 2. i think Tesla does a great job of keeping the car in the center of the lane without "ping ponging", do you think audi does just as good at this? 3. does it handle big sweeping turns like well in lane assist or does it need to manually be driven in those type of situations. thx! DO A REVIEW ON YOUR VENTILATED SEATS!!! Good real life demonstration of the system. 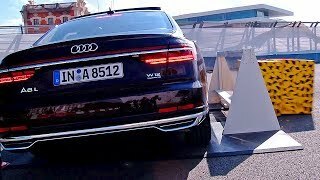 I've driven my friend's 2018 Audi S5 prestige (fully loaded), and in my opinion I really do not trust the lane keep assistance system except for when its in the stop and go traffic mode, as I have found that it just tends to play ping pong with the car in the lane by bouncing from one line to the other. It can also be finicky with the quality of the painted lines on the road, but most autonomous systems have difficulty reading lane lines (which often times on Long Island, NY aren't always clear and can be faded). I have also found that with lane keep assist on--while driving faster than the stop and go limit--it will half the time fight against you(very slightly, but still resists your inputs to a degree which is enough to be noticeable) while you are steering to maintain in the center of your lane, and it will still be trying to play ping pong with the lines. 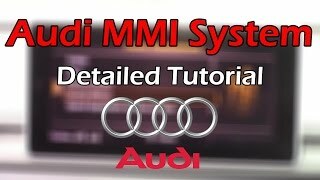 Maybe(hopefully) Audi will be updating and improving the system as time goes on (hopefully they update the software in current gen cars with it installed, unless they end up updating/increasing the array of sensors being used by this system in the future). Nick Sequino I agree with everything you say here - definitely struggles with poorly painted lane lines. There is a setting that you can set in the MMI to set lane assist to early and that stops the ping pong effect - it intervenes earlier so you don't have to be leaving the lane for it to come into effect. Also there is a second setting for the lane assist to use GPS guidance to anticipate turns. Once I turned both of those settings on it stopped the ping pong effect. Also, you want the car in comfort mode for traffic jam assist - it is much smoother in the breaking - In dynamic mode it will stop pretty hard and just not be very smooth. Audi is so analog. 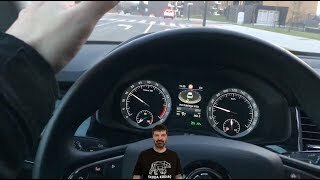 Thanks for video, definitely buying Tesla now! +Rob McCulloch exactly. I filmed this in 5 minutes and uploaded it a minute later. Given the amount of time spent and the amount of positive feedback received I think most people appreciate the video. Thanks so much for checking out the video ! Not confusing at all. I thought this was the best video I've seen in explaining the Traffic Jam feature. It's not a professional video, and it's not pretending to be. It's an honest accounting of how this feature works in a vehicle somebody actually owns. Hey man it's not bad for one cut while driving in real traffic. It gets the point across and it literally took my 10 minutes to make and publish. I'm not a full time YouTuber or anything like that. If I was I would have had someone else film while I was driving and then recorded a narration over the clip. This is not meant to be a professionally edited and filmed video. Crazy thing is it is more detailed than pretty much every other video on the subject. Ma che cazzo fai? Ma è illegale sta roba. Tesla Model 3 is better than this outdated VCR on wheels. Steve Ortmann Has OTA updates to improve it better than factory spec as noted in the phone call between consumer reports and Elon. No issues here with braking, but when Audi needs to issue a recall you need to take it to the dealership. and how about those brakes? Lol, Tesla has no soul. It's a soap bar on wheels. Waiting on my s4 with traffic assist. Thanks for making this. I appreciated your introduction to this feature. Dan Robson when I got mine I thought I bought the wrong package lol - I was like where the heck is my driver assistance option LOL. Waste of money for a car of this price to not have autopilot and auto lane change like the Tesla Model 3. NeutralGenericUser A4 convinced me that it's pretty much like a blackberry for an iPhone x price. As in I'm not wasting money on an outdated styling and hardware. Where's the smartphone fast touchscreen with apple Gui and display quality nicer than an iPad pro,hidden air slit behind the clean dash. More center console storage, and no tunnel hump at the rear. Automated charge port that lights up , excellent sound system that I can listen all day in my garage, with voice commands that plays songs in seconds, smartphone app that can preheat the car along with camper mode all without worrying about carbon monoxide poisoning. OTA updates that improve autopilot, and new Easter eggs or features. Nicer door handles that are heated and cooled. Frunk and deep well trunk. Large glass roof, and dual motors. And the Model 3 looks way nicer , the Audi looks clunky and the grill is nasty. 0-60 in 4.4-4.6 seconds and a full charge everyday and no need for gas errands to pay for manual labor to hold a metal gas pump like a mechanic. Oh and summon, autolane change, autopark, Autopilot live info like seeing cars through fog, auto wipers that don't use outdated rain sensors but the neural network to see the rain. Then there's the driving experience that's very sporty like a porsche Cayman, and as balanced as an E46 m3. NeutralGenericUser I'm buying a Model 3 instead of this rip off , along with half a million others. MK3MO 2018 S4 or 2017 S4 wasn't available when I bought this car. Trust me I wish I could have been more patient. An S4 is only 7K more than my A4. Ugh. 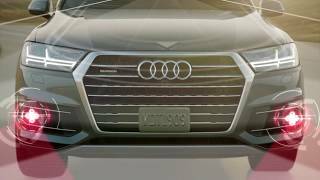 What's the difference between traffic jam assist and adaptive cruise control with stop and go with active lane assist? Adaptive cruise control uses radar to control the distance between you and the car in front of you. Lane assist detects if you are going out of your lane and makes a comparatively harsh correction to wake you up. Traffic Jam Assist uses the camera to monitor OTHER VEHICLES in front of you as well as monitor the lane and make SOFT corrections. It will not do this unless you are following cars. Lane assist doesn't care about following cars. Traffic Jam Assist does. And it's nicer. To directly answer your question: on the A/S 4 and A/S 5 as well as Q5 and SQ5 models adaptive cruise feature TJA. On the A/S 3 and most other Audi models it does not have TJA. Without TJA if you're stationary too long you have to manually intervene to start adaptive cruse. Active lane assist will hold your vehicle in the lane and provide limited steering input to effectively guide your car around most turns. With or without Traffic Jam Assist it will stop holding the lane (steering for you) if A) it can't detect the road edge OR B) you drop below 40 mph. TJA will not keep the lane at low speeds. TJA simply enables the automated resume after an extended stop. On the screen you have on the right showing the left of the Virtual Cockpit you would see the status as 'traffic jam assist available'. An A/S 4/5 with TJA will happily creep along with traffic until the sun burns out or you run out of gas (whatever happens first). Once traffic clears adaptive cruise will resume and the car will accelerate to your set maximum. At higher speeds the vehicle (as well as basically all systems similar to it...) has a limited ability to detect fully-stopped objects (including vehicles) but has an excellent ability to detect slowly-moving objects. Awesome. Audi is definitely going on my short list after my current lease expires. I just hope that in the next two years they improve the autonomous driving features to not have to 'touch' the wheel for longer times. 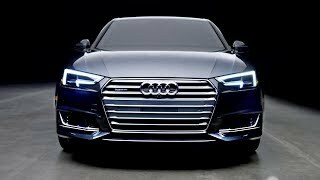 the a8 you dont have to touch it. 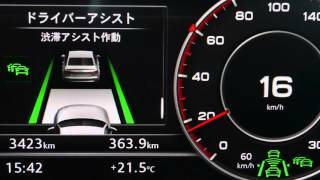 What specifically does congestion assist add over lane assist and adaptive cruise control? congestion assist is for below 40mph only. omg. You're video came sincerely in handy just minutes ago. I have had my factory ordered 2017 Audi A4 Prestige (same interior as yours! Manhattan grey metallic exterior) for over a year (delivery last spring 2016). I have been driving it enjoying ACC, Lane assist, congestion assist without having to know too much to be honest. Recently, my car lost the ability to pick up the lanes and I could not understand why congestion assist or lane assist was not working to keep me in between the lines or steer like it used to. It also stopped showing me the traffic line lines on the dash and the heads up display! Even took it to the Audi dealer and after two days, they could not fix it for me telling me that there are no faults in the computer and the tech got the lane departure assist to work for him. Driving home, I had the same problems I complained about. I got home less than an hour ago frustrated and disappointed that they didn't fix it. I went online. YouTube has it all I thought. Your video came up first and within 2-3 mins. I had the answer to my problem! The lane assist button on the end of the turn signal indicator must have been inadvertently pressed and turned off the lane assist! I pressed it and PRESTO! FIXED! THANK YOU! Pretty meh compared to the latest 10.4 autopilot update on the Model 3.
unr1 I'm sure it's in the manual, but when you first get this car one of the coolest features is traffic jam assist and a lot of people don't fully know how it works. This is also helpful to people considering the A4 that want to see how well this feature works. So happy I could help. I remember when my car was delivered and I couldnt figure out how lane assist or traffic jam assist worked and I literally thought they shipped my car without the driver assistance package LOL. Major meltdown for sure. Luckily I was able to figure it out and enjoy this amazing feature. I absolutely love having this in my car. Its a lifesaver on days when there is a ton of traffic. Does the HUD display any info other than speed and auto-systems information? For example in my BMW I could bring up the phone book or music tracks on the HUD. Does the A4 allow you to do that too? Thanks for the informative video. Nice footage! What camera did you use? Sony a6500 - highly recommend it. Thank you from the UK too. It's a feature I'm thinking of adding to my build for a 2018 car so I was looking for videos. 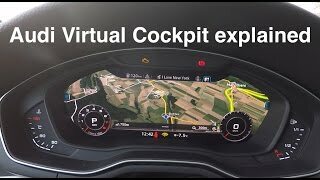 Thanks for the video - I'm surprised there aren't more videos out there demonstrating this key feature which I'd like to have in my next car. 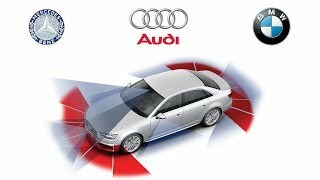 Audi Pre Sense - How does it work?